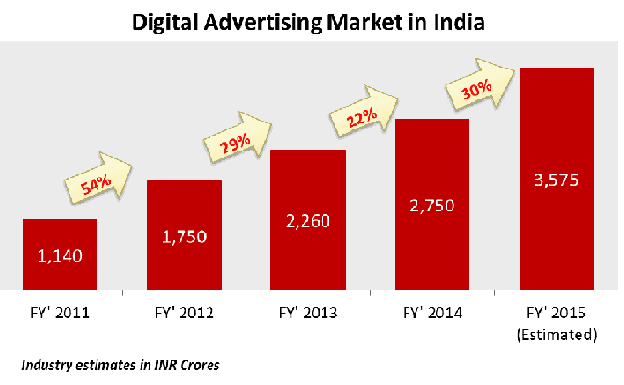 A recent research on ‘Digital Advertising in India’ revealed that the online advertising market in India is expected to reach RS. 3,575 Crore by March 2015 with a year-on-year (Y-o-Y) growth rate of 30%. If you look back at the data of just a few months ago, you will find that it market was pegged at Rs. 2,750 Crore in March 2014. The report however will not surprise you the way entrepreneurs are getting benefited by the online advertising in accomplishing multiple business goals by following its right practices. 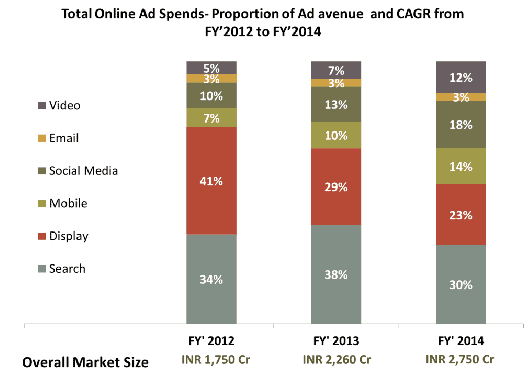 A very important fact that came out during the research was that Search and Display are the top two contributors to the total Digital Advertisement Spends in India at present with search ads constituting 38% of the overall ad spends followed by Display ads which contribute 29% and Social Media contributing 13% of overall Digital Advertisement spends. However, it is expected that there will be a reduction in the proportion of spends on Search advertisements and that spends will increase on Email, Video and Mobile advertisements. So, marketers can grasp the message that the report is trying to give and allocate their online advertising budget accordingly in future. As far as spends on Video ads are concerned, there will be a growth Video ads by 2015 and that it will contribute 12% to the overall market share of Digital Advertisements. Talking about the financial year ending in March 2014, there was a reduction in contribution of Search spends, which was 30% of the overall Digital Advertisement spends i.e. contributing RS. 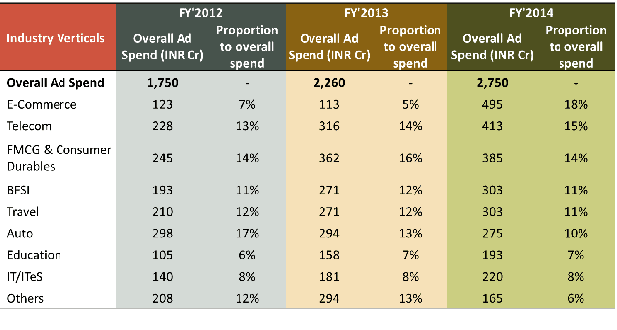 825 Crore to the total digital advertisement market. However, when it comes to the industry wise spends, e-Commerce, Telecom and FMCG & Consumer durables are the top 3 verticals driving the digital advertisement spends in India, as revealed by the report.